Selected by the US Secretary of Commerce as one of the 12 advanced manufacturing communities in the country, San Diego is on the forefront of helping to strengthen American manufacturing. 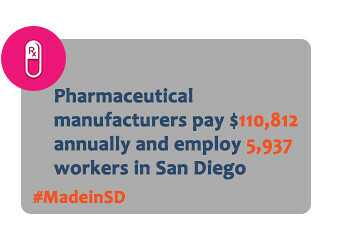 Manufacturing supports more than 90,000 jobs throughout San Diego County. National Manufacturing Day on October 3 provides San Diego and Northern Baja manufacturers an opportunity to highlight to the local community and the country, the diverse products that are manufactured in our region. 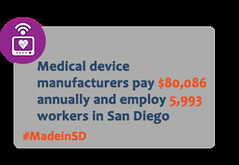 San Diego County’s 2,909 manufacturers employ 94,445. Manufacturing industry jobs pay on average $75,824 annually, compared to the average private employer at $53,778. Manufacturing industry jobs pay about 41 percent more than the average private job. The manufacturing industry represents about 8.7 percent of all jobs in San Diego and about 12.2 percent of all wages/pay. The manufacturing industry contributes more than $7.1 billion in wages every year. On Oct. 3, many San Diego and Northern Baja companies will open their doors to the public as part MFG Day, a national program that addresses common misperceptions about the manufacturing industry. If you know a manufacturer in our region, encourage them to participate! Participants currently confirmed to host tours include: 3D Robotics, D&K Engineering and more. MFgday.com has the complete list. The tours will be preceded by a breakfast panel and discussion with leaders in the manufacturing industry at San Diego Central Public Library including California Manufacturers and Technology Association, 3D Robotics, CareFusion, General Dynamics NASSCO, Sector 9, and ViaSat. To register to attend, visit https://sandiegomfgday2014.eventbrite.com. Thank you to our media partner, San Diego Business Journal.